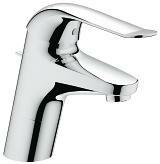 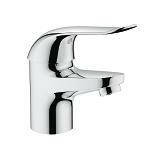 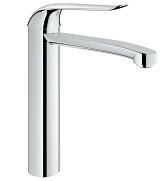 Washing your hands with your hands free – this is the idea behind the wall-mounted Euroeco mixers. 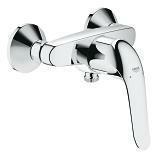 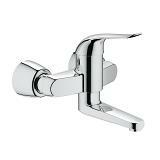 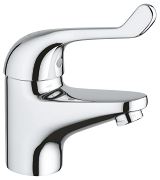 Wall-mounted installation keeps the basin free, and in order to reduce the risk of accidents caused by projecting parts, faucet levers and spouts are available in a choice of lengths. 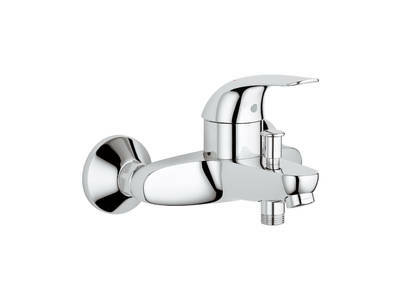 Because the flow rate can be variably pre-set, the robust metal lever only has to be pushed from left to right (left: cold, right: warm; maximum temperature can be pre-set). 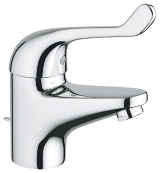 This helps control both water consumption and energy costs. 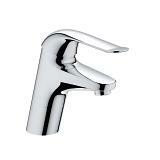 To spare users from "hot" surprises, the water is always cold when the faucet is first opened. 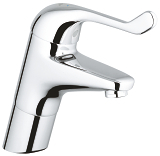 A laminar flow prevents bacteria in the air entering the water and the smooth, easy-to-clean surface of the fitting combine to ensure perfectly hygienic water.